Launched in 1976, the Introkit appeared to be very popular. It was the first affordable all-in-one computer everyone could acquire to know a bit about computers. The basic version was really minimalist: one SC/MP (or "Scamp") microprocessor, one 512-byte ROM containing a monitor program and 256 bytes of RAM for user's programs. Once everything soldered and wire-wrapped, the Introkit was a complete computer and an efficient learning tool. The novice programmer could enter, modify and run programs and thus learn all hardware and software basic concepts of any computing system. Several of these kits - and other SC/MP machines, were connected to larger computers thanks to the unique and advanced ability of the SC/MP CPU to completely share its system bus with other processors, and thus run smoothly in a multiprocessor environment. 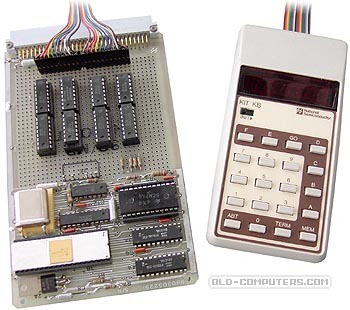 Chris Curry took the Introkit as a starting point to design the MK-14 training board, first Sinclair computer. The Introkit was indeed a TTY machine, with a modified NSC calculator case and keys forming the (extra cost) KBDkit and a patched ROM to scan the keys. The Introkit/KBDkit to MK14 development liaison to Science of Cambridge was Tony Amendt, another National Semiconductor Field Applications Engineer. The SC/MP LCDS was the official development tool - 'Low Cost Development System' and there was a multiprocessing card demo for it that was quite impressive. Might even have that in my attic somewhere! The multiprocessing architecture reappeared on the Series 32000 (aka NS16000) micros that were used in the Sequent 'Balance' series of Unix machines a decade later. Special thanks to Jorge Montalv�o Fernandes who donated us this computer ! see more National Semiconductor Introkit Ebay auctions !